We could see each other through the fence. We could hear each other’s cheers, singing and shouted greetings. We were north and south of a border created by money, politics and blood. At the risk of dancing into semantic inanity, there is a difference between protesting and demonstrating. Protesting is the act of pointing out a wrong or injustice with the insistence that those individuals or systems responsible for the wrong or injustice correct their actions, policies or systems. Demonstrating is the act of publicly expressing a value that either needs to be strengthened or lifted up at a certain time and place. On December 10th of last year, I met up with somewhere between 300 and 400 interfaith partners in the parking lot of Border Field State Park. About 15 miles to the north is San Diego. Tijuana is within sight a little south as is the Pacific Ocean. You might have seen this beach before in pictures. It’s the place where a southern border fence cuts the beach in half and stretches out into the ocean. This is very near the places where refugees from violence and poverty further south had gathered with the hopes they could find safety in the United States. Just a couple weeks before, several of these folks – in an act of desperation – had run towards the southern side of the border with the hopes of making it to the northern side. The US responded to this desperation by shooting tear gas, pepper spray and – reportedly – rubber bullets across the border at the individuals and families trying to cross. The American Friends Service Committee has been working in this area for years and put out an invitation for religious folks from across the US to join them on December 10th to protest against the recent action of our government and the anti-refugee prejudice being promoted by the President. 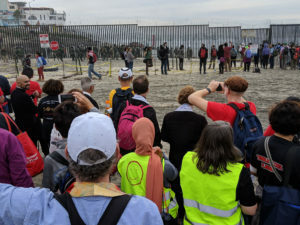 We gathered to remind people that there was a direct link between decades-old US foreign policies and the ways it caused the desperation of those on the other side of the border fence. We gathered as representatives of those in our faith communities that were concerned about the same things. We started off with a press conference in the parking lot then walked a trail to the beach. We sang songs. We chanted. We avoided puddles from the recent rain. We saw old friends and made new ones. We learned about each other’s faiths and the values we shared. We laughed a bit at the ridiculousness of the 5 helicopters flying overhead; the drones that flew by; and the folks on hilltops with binoculars and telescopic lens pointed at this group of religious folks wearing stoles, scarves, clergy collars, kippa, hijab and lots of sunscreen. Once we reached the beach, we walked the distance from the trailhead to the border in silence; a kind of prayer we all practice. 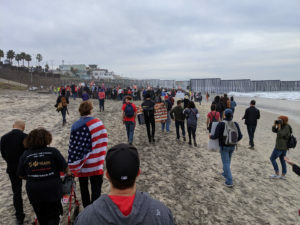 When we were near the border, some of us held back and a trained group of 30-40 folks walked into the fifty feet near the wall that is considered off limits by the US government. 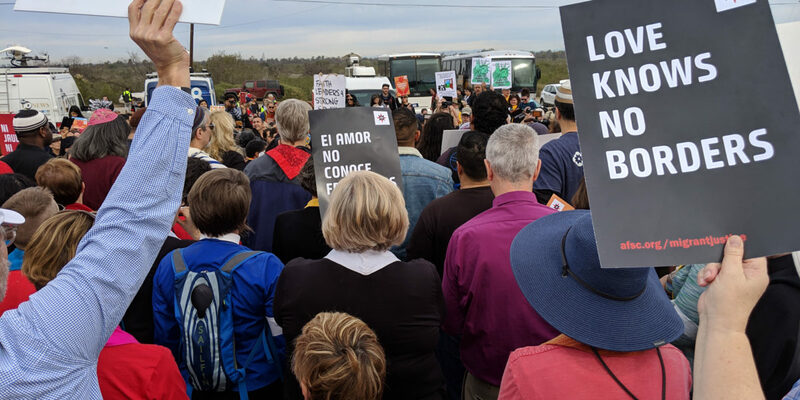 When asked to move these pastors, rabbis, imams, monks, sisters and other religious folks politely refused as an act of protest and – to the cheers songs and encouragement coming from both sides of the border – they were arrested. This sacrifice and protest was important and beautiful. What our presence demonstrated was important, too. On the northern side of the border were people some think never get along, getting along and working together. We demonstrated that you don’t have to believe the same things to value the same things. We learned the power in each other’s songs and presence. We also demonstrated something else that was important. We were together in that space with people just south of the border. We could see each other through the fence. We could hear each other’s cheers, singing and shouted greetings. We were north and south of a border created by money, politics and blood. But we were on the same side. The Rev. Mike Denton and his family live in Seattle. 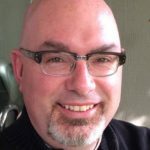 He serves as the Conference Minister of the Pacific Northwest Conference of The United Church of Christ.